An old scandinavian saying is "your knife is your life" and I can't think of a better truism when out in the woods. I went through the whole custom knife thing buying from a lot of the top makers in the world but was never completely satisfied, I just can't understand why a bit of metal and wood which you can buy for pennies should end up costing hundreds of pounds, skill or no skill, aesthetics or not, but a 5000% mark up is too rich for my blood. So for the past 4 or 5 years I've been going back to my first love, the Mora knife, it does everything ( and more) that a custom will and they are as cheap as chips, although I still haven't got rid of the magpie in me yet. 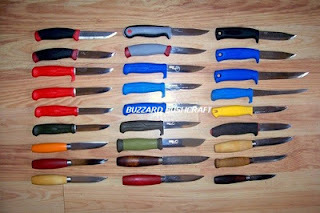 This is a part of my collection, and as you can see they are well used and I'm not afraid to modify them if I need to, something I would never do with a custom.Each one in the picture is different, either by steel ,maker or model, but they all originate from Mora of Sweden, if you don't use a mora, you're not a real bushcrafter. I use them hard, and I love owning knives, and making them, and using them. They are up to par with the best of them. They are dead ugly and dead functional. But the wooden handled ones are even pleasing to the eye. you can get three for £25 quid and work thenm hard with no worries. The now discontinued Mora 510....but I put quite a few of them away when I heard they were to be discontinued a few years back,so I have no fear of running out of my favourite knife! i love moras they are so easy the sharpen and so cheep. i couldent live without it. 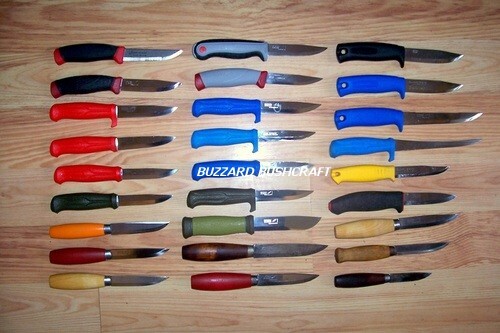 Could you please tell me, what makers stamp is on the orange handled "slidkniv 1" (left column, 3rd from the bottom)!? I got my hands on a pre 1960 "Bud-Carl Andersson" the other day, brand new in a Swedish military medics bag.